Toddy and palm wine are alcoholic beverages that are made by fermenting the sugary sap from various palm plants. Virtually any sugary plant sap can be processed into an alcoholic beverage – it just needs the correct yeasts, temperature and processing conditions. Throughout the world, alcoholic drinks are made from the juices of locally grown plants including coconut palm, oil palm, wild date palm, nipa palm, raphia palm and kithul palm. The terms toddy and palm wine are both used to describe similar alcoholic drinks – the terminology varies from country to country. In this brief toddy refers to the fermented flower sap from the coconut palm (Cocus neusifera) and palm wine refers to the fermented sap, collected from the trunk, of other palms including raphia (Raphia hookeri or R. vinifera) and the oil palm (Elaeis guineense). Palm wine is the fermented sap of certain varieties of palm trees including raphia palm (Raphia hookeri or R. vinifera) and the oil palm (Elaeis guineense). It is collected by tapping the top of the trunk or, in some countries, by felling the palm tree and boring a hole into the trunk. It is a cloudy, whitish beverage with a sweet alcoholic taste and a very short shelf life of only one day. The wine is consumed in a variety of flavors varying from sweet unfermented to sour, fermented and vinegary. There are many variations of the same product and no individual method or recipe. Palm wine is particularly common in parts of Africa, South India, Myanmar and Mexico. Some of the local names for the product include emu and ogogoro in Nigeria and nsafufuo in Ghana, kallu in South India and tuba in Mexico. 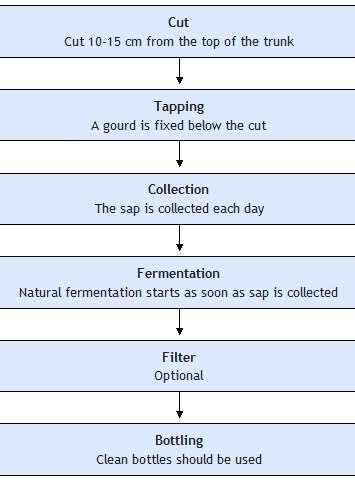 The process of sap fermentation is an alcoholic fermentation of the sugars in the sap to produce alcohol and carbon dioxide gas. The extracted sap is sweet. After collection it undergoes a rapid natural fermentation to produce alcohol. The shelf life of the product is very short – only one day – after which the wine becomes acidic. The sap should be collected from a growing palm. It is collected by tapping the palm. This involves making a small incision in the bark of the palm, about 15cm from the top of the trunk. A clean gourd is tied around the tree to collect the sap, which runs into it. The sap is collected each day and should be consumed within 5-12 hours of collection. Fresh palm juice is a sweet, clear, colorless juice containing 10-12 percent sugar. Fermentation starts soon after the sap is collected and within an hour or two becomes reasonably high in alcohol (up to 4%). If allowed to continue to ferment for more than a day, it starts turning into vinegar. Some people like a vinegary flavor. The quality of the final wine is determined by the conditions used for the collection of the sap. Often the collecting gourd is not washed between collections and residual yeasts in the gourd quickly begin the fermentation. This is beneficial as it prevents the growth of bacteria which can spoil the sap. Packaging is usually only required to keep the product clean and to transport it for its relatively short shelf life. Clean glass or plastic bottles should be used. The product should be kept in a cool place away from direct sunlight. Toddy is an alcoholic drink made by the fermentation of the flower sap from a coconut palm (Cocus neusifera). It is white and sweet with a characteristic flavor and contains between 4 and 6% alcohol. Toddy has a short shelf life of about 24 hours, which can be extended if it is refrigerated. A natural fermentation takes place due to yeasts that are present in the sap and those that are added from a previous batch of toddy. The sugar in the sap is partly fermented to alcohol, which helps to preserve the product. It requires refrigeration if it needs to be stored for more than 24 hours. The collecting pots should not be washed out. That way they retain a small amount of starter inoculum for future fermentations. However, it is important to ensure that they are kept clean and do not become contaminated by other bacteria. The fermentation vessels should be kept clean and the product must be hygienically handled. The sap is collected by slicing off the tip of an unopened flower. The flower should be clean and free from infection or mold. Flowers can be used until they cease to provide sap or become infected. The sap oozes out and is collected in a small pot tied underneath. A small amount of toddy from the previous days fermentation should be left in the pot to start the fermentation. The fermentation starts as soon as the sap collects in the pots on the palms, particularly if a small amount of toddy is left in the pots. The collecting pots are emptied into a larger vessel and the fermentation continues for six to eight hours. The product is not usually packaged. It is sold immediately or transferred to a refrigerator to extend its shelf life for one or two days. Toddy can be distilled to make a brandy-like spirit (known as Arrack in Sri Lanka). Distillation requires a special license and is banned in some countries. Check with the local authorities before starting this process. * Sap collection – Slice off the tip of the unopened flower. Tie a small point under the cut and collect the sap that oozes out. Leave a small amount of toddy in the pot to initiate fermentation. * Fermentation – Empty the collecting pots into a fermentation vessel. Continue to ferment for 6-8 hours. * Storage – Toddy is usually sold immediately but can be stored in a refrigerator for 1-2 days. Pulque is the national drink in Mexico. It is a milky, slightly foamy, viscous acidic beverage that is obtained by fermentation of aguamiel, which is the name given to the juices of various cacti (Agave atrovirens and A. americana). Pulque contains between six and seven percent alcohol and can be distilled to make Mezcal. The juices are extracted from cacti when they are eight to ten years old. Fermentation takes place spontaneously, although occasionally the juices are inoculated with a starter from previous fermentations. The juice is allowed to ferment naturally. Ulanzi is fermented bamboo sap, obtained by tapping the young bamboo shoots during the rainy season. It is a clear, whitish drink with a sweet and alcoholic flavor. The bamboo shoots should be young to achieve a high yield of sap. The growing tip is removed and a container fixed in place to collect the sap. The container should be clean to prevent contamination of the fresh sap which may produce off-flavors. The raw material is an excellent substrate for microbial growth and fermentation starts immediately after collection. Fermentation can take between five and twelve hours depending on the strength of the final product desired. Packaging is usually only required to keep the product for its relatively short shelf life. This document was produced by Dr. S Azam Ali for Practical Action in March 2008. Dr. S Azam-Ali is a consultant in food processing and nutrition with over 15 years experience of working with small-scale processors in developing countries. Nice guide. Thanks for sharing this.